When the time came to create an exhibition on ocean liners, one name immediately came to mind: Stephen Lash. 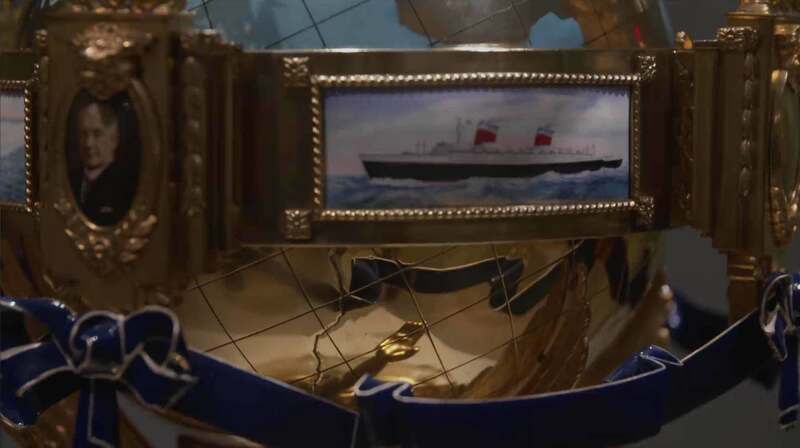 As owner of one of the world’s best private collections — one that represents 100 years of ocean liners from all parts of the globe — this longtime friend of PEM was happy to contribute to what would become the Ocean Liners: Glamour, Speed, and Style exhibition. Co-organized with the Victoria & Albert Museum in London, the show closes at PEM on October 9 and hops the pond to open in London February 3 to June 10. Stephen has lived in the world of ocean liners for his entire life,” said Daniel Finamore, PEM’s Russell W. Knight Curator of Maritime Art and History. “He is extremely knowledgeable about them and has gone to great lengths to track down important works. Stephen Lash at the exhibition opening. Photo by Kathy Tarantola. 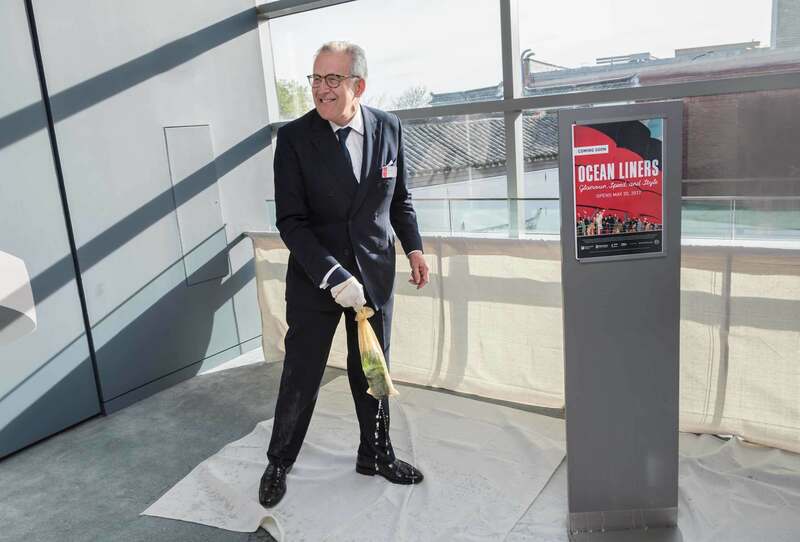 At the opening of this groundbreaking exhibition, PEM announced that Lash has generously promised his entire ocean liner collection to the museum. His donation of more than 1,000 works, which includes posters, paintings and furniture, elevates the museums holdings to an exciting new level. 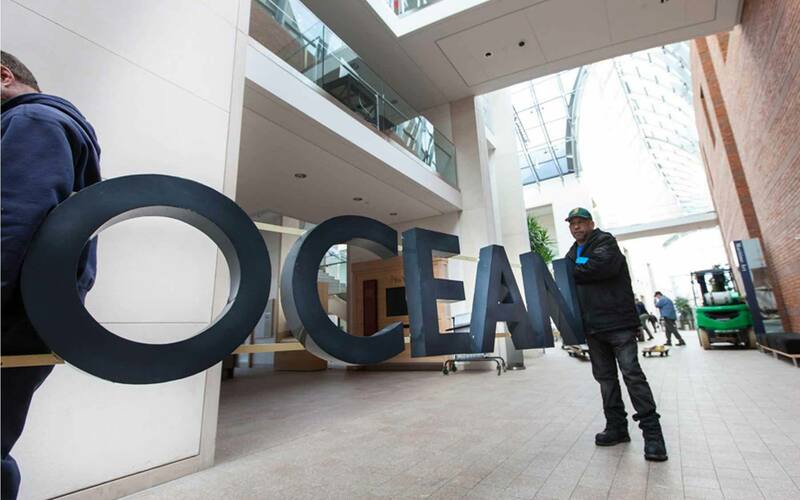 Among the pieces in the PEM Overseer’s collection, now on view in Ocean Liners, is a Cunard line advertisement of people waving goodbye from the deck of the Berengaria and 24-inch steel letters that spell out OCEAN TERMINAL that once graced the exterior of Berth 102 in Southampton, England. Other pieces include a 1934 sketch by British artist Doris Zinkeisen for a mural on Queen Mary and closet doors from the first-class playroom on Normandie, whimsically painted by French artist Jacqueline Duché. Piece gifted from Lash being installed in the Atrium. Photo by Bob Packert. Bernard Lachèvre Visitez L’Extrême-Orient par les Messageries Maritimes (detail), 1928. Color lithograph. Peabody Essex Museum, Gift of Stephen S. Lash, 2003, M27523.